Algie Brown is a 2017 NFL Draft prospect represented by Off-Tackle Sports. The 6-foot-1 250 pound running back and fullback is a graduating senior at Brigham Young University. 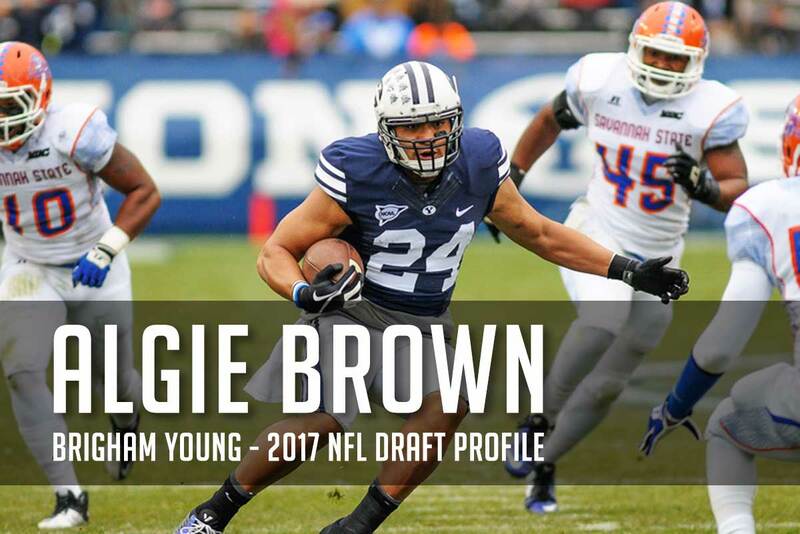 At BYU Brown played in 46 total games, where he caught 35 passes for 285 yards (8.1 avg.) and three touchdowns and rushed 258 times for 1310 yards (5.1 avg.) and 13 touchdowns. 13 of his 16 total touchdowns came during his junior season where he was the leading rusher for BYU, stepping up for the injured Jamaal Williams. As a senior Brown added some weight and moved to full back where he was used primarily as a blocking back. Brown prepped at Skyline High School (UT), and was recruited by Cal, Michigan, Oregon, San Diego State, Stanford, Utah State, and Washington. He redshirted in 2010 and then served an LDS mission to Sao Paulo Brazil. Roster Years: 2010, 2013-16 HT/WT: 6’1”, 250 lbs. Rated 14 out of 85 full backs and no. 533 overall on NFL Draft Scout. 2017 NFL Draft Projection: Undrafted free agent. If you have any additional information or insight about this NFL prospect, please include it in the comment section below.